This is one of the very rare times in the media when you actually get to hear or read, some good news about Muslims. One news paper recently reported that the premier league will now give a non-alcoholic alternative to Muslim players who are the man of the match. It’s a Premier League ritual and a big moment for the man of the match… as he is presented with a large bottle of champagne in the tunnel after the game. But a series of embarrassing incidents involving Muslim footballers has prompted the league to offer a non-alcoholic alternative from the Middle East. From now on, any Muslim man of the match will be rewarded with a bottle of waard – a combination of rosewater and pomegranate seen as a more ‘culturally appropriate’ token of their achievement. Last weekend, Newcastle United striker Demba Ba, declined even to pass team-mate Jonas Gutierrez the champagne after Gutierrez was voted man of the match.A rose syrup like this will be offered to Muslim players instead of champagne from now on. 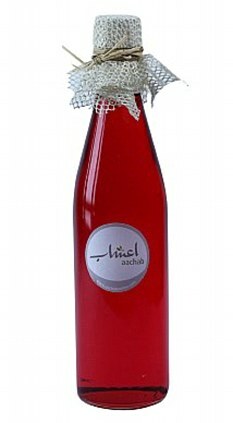 A rose syrup like this will be offered to Muslim players instead of champagne from now on. 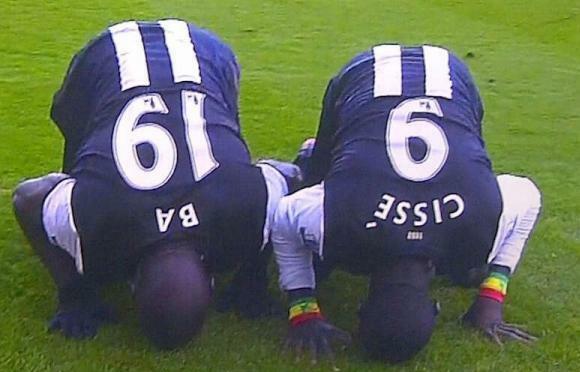 Ba, whose goal celebration is the Sujood, the prostration performed in prayer to Allah, is one of four Muslim players at Newcastle. The others are Papiss Cisse, Leon Best and Hatem Ben Arfa. Muslim players at Manchester City include Toure and his brother Kolo, Edin Dzeko and Samir Nasri. Firstly, it is nice to see more muslim players coming through the ranks in football. Secondly, inshaAllah with hope and anticipation as more of our brethren come through, we shall see great changes in the overall game being made. Football is the new religion for people here in the UK and elsewhere. If more of our brethren can infiltrate the long-held irreligious game of football, then maybe we are not far from football becoming a means to draw people back to Allah (god). It is truly amazing to see, the very thing people are using to go away from God, is slowly being used to bring them back. Although it may seem as a far-fetched idea, and one that may not come true in our lifetimes, but know this, Allah works in mysterious ways. In ways me and you would not have ever thought of. The very thing people have begun to worship and follow like a religion is slowly but surely, being used as a vehicle (by the grace of god) to drive people back to the actual thing which they should be supporting, that being the righteous ways of the pious. I remember a time in football when there was hardly a mention of religion. Never mind having the word of ‘Muslim’ and ‘football’ being used in the same sentence! It is unbelievable and hard to understand how despite all the hard efforts by the media and the army of the devils to kick out ‘Islam’ from the minds, hearts and souls of people. Islam keeps on coming back harder and more determined in the lives of people. Not because of the efforts of me and you. But purely by the will of Allah. People simply cannot get away from ‘Islam’ no matter how much they may hate it. ‘Islam’ is everywhere. From the very comfort seeking means people use, like football and other activities ‘Islam’ is even there. Back when 9/11 occurred, many thought ‘this is the time to subdue ‘Islam’ and put it on the back foot’. But, that episode actually caused Islam to become more known,and publicized across to the American populace. People went out of their homes and offices thinking ‘what is this ‘Islam’?’ Once the open-minded and true seekers, saw the truthfulness of Islam, it caused mass conversions to take places in the immediate days after 9/11. Masha Allah am soo proud of him. I love you Yaya Toure. May Allah bless you.